Riding a tricycle for adults is a lot more than just a unique and fun way to get from one place to another; it is also a terrific form of low-impact cardio exercise as well. Many of the adult tricycles on the market come with large cargo baskets so they are functional as well as fun. 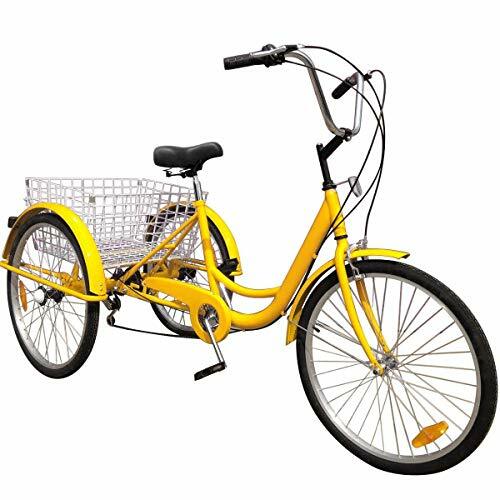 The best adult tricycle is made from quality materials that are lightweight, strong and provide plenty of durability. 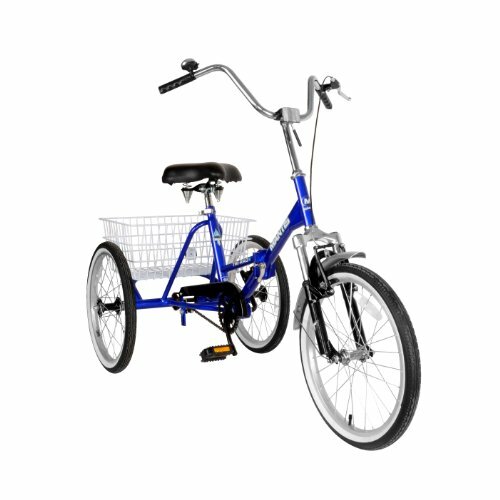 Our pick, Schwinn Meridian Adult Tricycle, is the perfect tricycle for adults. The key to finding the perfect tricycle for you when there are so many to choose from, is to ask yourself what is most important and make your decision based on that answer. Is it important to have a comfortable, wide seat? Do you want to have a lot of gears to choose from when you are riding? Do you want to be able to just lean back and have an easy ride? Regardless of what is most important to you, there is an adult tricycle that will give you what you want. You can use it for quick trips to the grocery store or to take a load or two of wash to the Laundromat. The three-wheeled design of all adult trikes makes them a lot more stable than regular bikes. This makes them popular with people who may avoid bicycles because they are afraid of falling. There are several things you will want to look for when you are researching all the different models that are available. This guide will help you learn about adult tricycles and also help you sort through all the choices so you can make an informed decision on one that will be perfect for you. If you imagine adult tricycles being heavy and cumbersome, this Schwinn Meridian Adult Tricycle will be a pleasant surprise. Its 24” alloy wheels and low stand over frame that is made from lightweight aluminum is much lighter than you may expect without feeling flimsy or cheap. The Schwinn Meridian is perfect for taking a secure and stable ride that features a superior mechanical design and build. It has one single speed so there are no gears to worry about. The springer cruiser seat is large and features a quick release adjustment so you can customize the height to your preferences. The handlebars have a swept back design that is complemented by the form of the cruiser frame. This provides you with the ultimate in comfort and gets rid of the possibility of back strain. 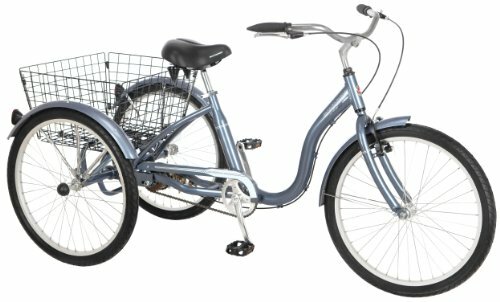 Other features of the Schwinn Meridian Adult Tricycle include the stainless steel spokes that are rust proof, and the beautiful slate blue finish that works for men or women. This trike is perfect for anyone regardless of age and can even be ridden easily by those in their late 70s, 80s and even 90s thanks to its simple-to-ride design. If you are looking for a ride that is worry free and comfortable, take a look at the Mantis Tri-Rad Folding Adult Tricycle. The conveniently located front V-brake with parking brake and low cut tricycle frame makes dismounting and mounting easy. The spring seat is large and comfortable, providing a great foundation for rides whether they are short or long. The trike frame folds up, making storage easier as well. The 20” tires have lightweight, aluminum rims and the steel frame features a steel suspension fork. Other features of this unique and enjoyable trike include a front fender, chain guard, bell, and rear storage basket so you can easily carry your purchases with you without struggling. The saddles of the trike are comfortable to step on and plenty large enough to offer stability. The adjustable stem is made of steel and can be adjusted to fit your needs easily. This is a great trike for any age rider. This trike has a weight capacity of 300 pounds. With Happybuy’s 24” adult tricycle you will be able to travel in style whether it is for pleasure or to get yourself back and forth to work each day. The high tensile steel provides you with a trike that is strong and durable. It has 6/7 speeds to choose from and features Revo twist shifters so you can easily and seamlessly pedal and shift. You can use this trike for exercise, pleasure riding or to get yourself to work or the store effortlessly. The large metal mesh, rear basket is great for carrying groceries. The back support of this trike, and the easy to reach seating make getting on and off the bike much easier than traditional bicycles. Other features that make this trike enjoyable and easy to ride are the front pull brake and back drum brake that will ensure safe stopping. This is a good adult tricycle for riding on rougher terrain, as the suspension system ensures a much smoother ride. The Happybuy Adult Trike comes with a 12 month manufacturer’s limited warranty as well. There is not one single adult tricycle that is perfect for everyone. People have different preferences so they will find certain trikes better suited to their needs than others. It doesn’t matter how old or young you are, if you have decided that you want an adult tricycle, you are sure to find one that meets your needs and preferences well. The purpose of the buyer’s guide below is to provide you with more information about these increasingly popular adult tricycles and to help you take that information and make a decision on one that will be perfect for you. These unique and fun-to-ride trikes are not just for seniors. They are becoming popular with people of all age groups. The three tricycles for adults that we have featured above are excellent choices for anyone interested in purchasing one for themselves or a loved one. All are from reputable companies and have numerous features that make these trikes easy to ride, easy to take care of and easy to store too. Use the information in this guide to make sorting through all of the different choices and styles easy and stress-free. You will appreciate the knowledge you have gained and will love how much fun you can have looking at the different models while you are searching. When you hear the term adult tricycle you may think of a really large, red tricycle like the one you rode as a child, but that is not the case at all. Adult tricycles are simply three-wheeled vehicle that is stylish, easy to ride, tip-proof and perfect for everyone from seniors to teens. Even those with physical limitations can enjoy riding an adult tricycle. All models of adult trikes have the popular step through design that makes getting on and off the trike easy. They also feature a stable platform that takes care of any balancing issues. When the trike is stopped, you can easily put both feet on the ground so you can sit comfortably. The upright riding position is very easy on the hands, back and rear end, especially those that have back supports. Adult tricycles use the same standard components that regular bicycles use so there are no special replacements parts that you will have to try and track down. Your trike will be able to be fixed or have parts replaced just as easily as their two wheeled counterparts. Another benefit to an adult tricycle is their ability to accommodate heavier weights than traditional bicycles can. This makes them an excellent choice for those who have a lot of weight to lose, but have trouble with regular bikes or walking. The adult trike gives them a way to exercise that is low impact and much easier to do when there is a lot of weight to lose. There are several different styles of adult tricycles on the market to choose from. We have listed several of the more common styles and provided some information about each of them so you will be able to understand the differences when you start shopping for your own adult trike. Upright Tricycle – The traditional upright trike is perfect for pleasure rides around your neighborhood. It is a great way to exercise and is good for running errands as well. Many upright design features a rear basket for holding groceries and other items. The gear options with an upright adult tricycle are most often single or triple speed styles. The three speed models are a little more expensive than the single speed styles but if you have hills to climb, being able to shift into a lower gear can make climbing those hills much easier. You will use both your upper and lower body to ride an upright trike so you can count on getting a good all over workout. Recumbent Tricycle – The style of a recumbent tricycle is very low to the ground with a longer frame. Riders will sit in a reclined position with the legs out in front to pedal. This is a good workout for the legs and core muscles. If you suffer from back pain, you may find that a recumbent trike is puts less strain on your back than the upright models. The design of a recumbent tricycle makes it a great choice for longer rides. Tandem Tricycle – If you want a tricycle that you can ride with someone else, look for a tandem style tricycle. These types of trikes have two seats that are either side by side or one in front of the other. A tandem tricycle will take up less room than two single trikes and maintenance costs will typically be less as well since you only have to maintain one vehicle. Electric Tricycles – Many people think that electric tricycles are for lazy people but this is not true at all. If you are riding long distances or you have a lot of inclines to contend with, you will appreciate the extra boost of power that an electric tricycle will provide. You only have to use the electric power when you want to so these trikes still allow you to get exercise when it is not in electric mode. Folding Tricycles – If storage space is a concern, there are many adult tricycles that offer folding capabilities as a feature. Folding tricycles are just as good and sturdy as non-folding models but their ability to fold up makes them the perfect choice for traveling with your trike or just storing it between rides. Folding tricycles are lightweight as well, making them perfect for riding to work where you can fold it up and take it into work with you without taking up too much room. There are a few things you will want to keep in mind when you are ready to start shopping for your adult tricycle. We have listed these tips below to help you get the most for your money. Start by determining your needs – What do you want an adult tricycle for? Will you be riding it to work each day? Using it for regular exercise or two run errands? The amount of time you will spend riding your trike can determine the style and durability it has. This doesn’t mean that you should purchase a cheap model if you will only be riding it occasionally, but it does mean that if you are using it on a daily basis for work commutes, errands and exercise, you will want to invest in a high quality adult tricycle that is long lasting and durable. Skipping the Electric Models – If your main purpose for purchasing a tricycle is to exercise and lose weight, you will want to go with a manual pedaling model and not an electric one. Even thought you can turn off the electric feature, it can get very tempting to get into the habit of using the electric feature rather than pedaling. Dealing with mobility issues – If you have physical limitations or mobility issues look for upright tricycles. Recumbent styles are more difficult to balance and could cause additional difficulties if you have mobility problems. There are several features that are commonly seen with adult tricycles. We have listed these features below. Take a look at this list and see which ones are the most important for you. When you are searching for your tricycle, make sure that the models you are looking for have these features. Stability – The three-wheeled design of the adult tricycle makes it very stable. It has a wide wheel base in the back that helps to prevent tip overs. When you dismount from the trike you will not have to use a kickstand or hold it up, as it will stand on its own. Upright trikes are more stable than the recumbent styles. Comfort – Being comfortable on your trike will ensure that you will actually use it for exercise and pleasure riding too. The recumbent style trikes offer exercisers a more comfortable and relaxed ride. The reason is the wide seat and reclining posture that provides plenty of back support. Uphill Help – Adult tricycles are much easier to ride uphill due to their improved balance over regular bicycles. This makes them much less difficult to ride uphill especially if the trike has different gears or is an electric model where you can get some extra help navigating those hills. Cargo Baskets – the wide rear wheel base makes it the perfect design for carrying items. A lot of upright tricycles have rear baskets that can be filled with groceries and other purchases. Some recumbent trikes have cargo baskets as well but it is not as commonly seen in those styles as it is in the upright designs. Adult tricycles are growing in popularity as more and more people discover just how enjoyable they are to ride. They are especially good for those wanting to lose weight that may have mobility issues or back pain but you can enjoy the benefits of an adult trike even if you are in perfect health. When you are looking for the perfect tricycle for your preferences and needs, you can take the information we have provided in this guide to help you sort through all of the great choices. Think about what you will be using the adult tricycle for and choose a style that fits that well. The three top rated choices we have featured above are great examples of the kind of terrific adult tricycles that are available. Any one of them would be an excellent choice for your needs. All three of them have lightweight frames, excellent construction, a cargo basket and long lasting durability you can count on. Which one appeals to your needs the most? If it’s not one of the three top rated, popular choices above, you now have the knowledge you need to make an informed decision that will make you happy for years to come.